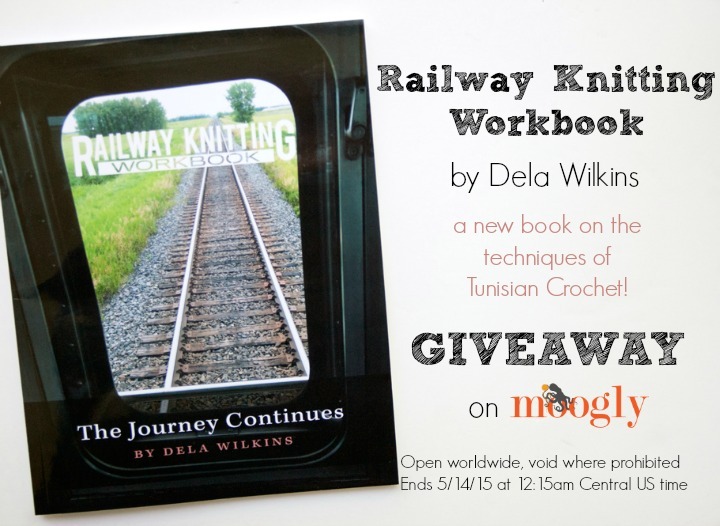 Railway Knitting Workbook by Dela Wilkins: Review and Giveaway on Moogly! 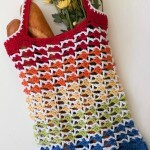 Railway Knitting Workbook is a new book by Dela Wilkins, all about Tunisian Crochet! 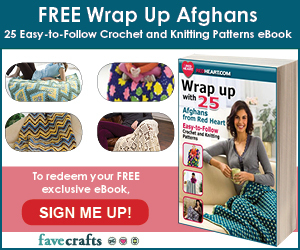 It’s a complete workbook, including everything from the basics, to stitch patterns, to shaping, to how to turn standard crochet and knitting patterns into Tunisian… and I get to give away a copy to one lucky reader! But first, why “Railway Knitting”? What sets this book apart? I asked the author, Dela Wilkins! Moogly: What led you to name your book on Tunisian crochet “Railway Knitting”? Dela: Railway Knitting is one of the nicknames for Tunisian crochet (since the 1880s), so whenever I did projects on the VIA train between Vancouver and Toronto (84 hours), that’s what I called it. In 2011 the staff on the train asked if I would like to work with a group of passengers and they would post the time on the activity board. The notice said Railway Knitting with Dela, so I stuck with that. It is easier for people to remember and look up when they get home. The first group was 25 people from 8 different countries. I shared my yarn and extra hooks, and as a result I am now part of the Artists-on-Board program with VIA Rail. The one thing I usually forget to tell people is that there is no access to Internet, no WiFi, not even cel phone service on most of the train route that I teach on! So we cannot look things up unless I bring printed copies of something. Moogly: What made you want to write this book, and what do you think sets it apart from other books on Tunisian crochet? 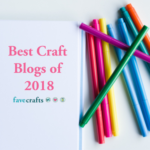 Dela: I found myself writing a small 16 page booklet in 2012 to hand out on the train, using the language of travel to describe the techniques and stitches. Folks on the train who had never knit or crocheted before seemed to catch on quickly and finished some amazing projects by the end of the journey. 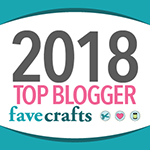 Based on more trips, more teaching and more questions, I searched for a basic comprehensive guidebook on Tunisian crochet to recommend, and could not find one in my teaching style. This book provides direction but not prescriptions for hook size and yarn options. 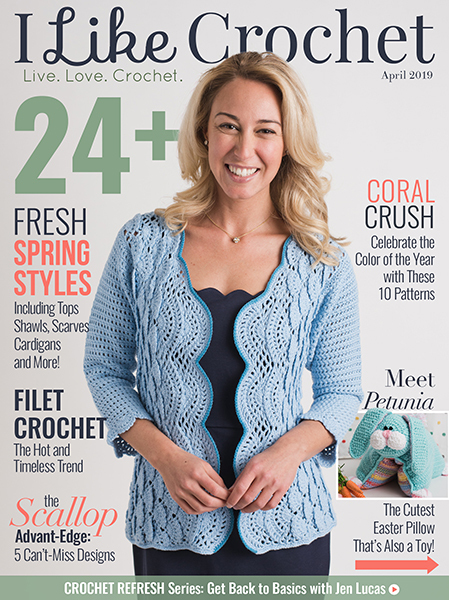 It crosses the boundaries to be able to use regular crochet and knitting concepts, and even sewing patterns. 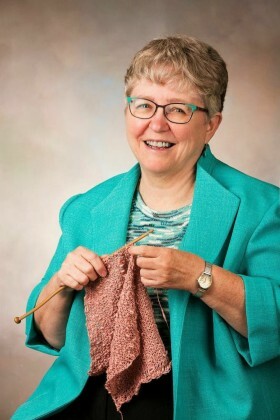 One of my mentors is a crochet judge at the fair and a former librarian. She encouraged me to publish the book so it would be available as a library book. 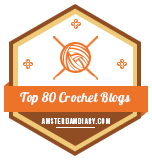 Moogly: What gets you the most excited about Tunisian Crochet? 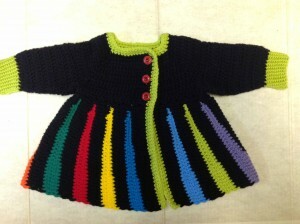 Dela: Because there are so few patterns for Tunisian crochet, I like to play with regular crochet and knitting patterns and interpret them into Tunisian crochet, as I did with the Moogly Eloise jacket and the Elizabeth Zimmermann Baby Surprise Jacket. This is also how I developed the Wobbel technique and the Tunisian Mobius worked from the centre out. Moogly: Where can people buy your book? 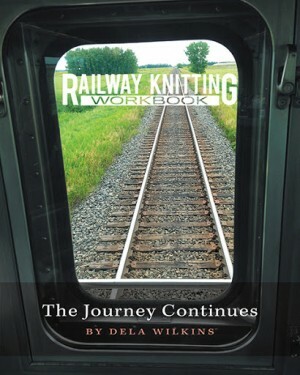 Dela: CLICK HERE to buy Railway Knitting Workbook from FriesenPress! So there you have it! Looking through Railway Knitting Workbook I’m impressed! This isn’t your standard patterns book. It’s more like a guide to lead you to your own tunisian crochet creations. And I’ve learned a lot already! There’s a wealth of knowledge in here, and for anyone who’s ready to explore tunisian crochet, and start using it to create their own ideas and designs, it’s a great book to have! Luckily, Dela has generously offered to give away one signed copy of Railway Knitting Workbook to a very lucky Moogly reader! Just enter in the Rafflecopter form below. This giveaway is open WORLDWIDE and ends 5/14/15 at 12:15am Central time. The Email Address entry is mandatory, the rest are for bonus entries only, and are not required to be entered in the giveaway. 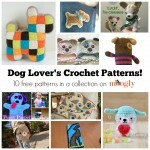 10 Free Crochet Patterns for Dog Lovers! 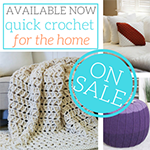 I have been looking for inspiration to try Tunisian crochet for a while now. this book has done it. Starting tomorrow . 😀 I hope you enjoy it Robinlynn! Just finishing a set of tunisian crochet pillow cases. Inspiration is always good. To win a copy of this book would mean such to me. When the idea of bucket lists came out a few yrs ago, I began to think about what I would have on my list. I’ve never really wanted to travel in Europe except maybe to go to Ireland and Scotland; but my no.1 thing on the list and it has stayed my no. 1 dream since the beginning was to take the Canadian train trip across the Rockies. Winning a copy would almost be like taking that trip!